First, it was dough that stubbornly refused to rise. I returned home from the gym fully expecting a puffy dough close to spilling out of the bowl. Instead, I was met with a lump that looked exactly as it did before I ran 6 miles on the treadmill. I knew my yeast was good so it had to be something about the way I mixed the dough that accidentally killed the yeast. I threw the dough in the fridge in desperation but 24 hours later it looked no different than before. Back to step one again. I like the more complex flavour by using poolish so half of the flour went into that in my second attempt. The poolish bubbled and fizzed like it should and I happily stirred in the rest of the ingredients. 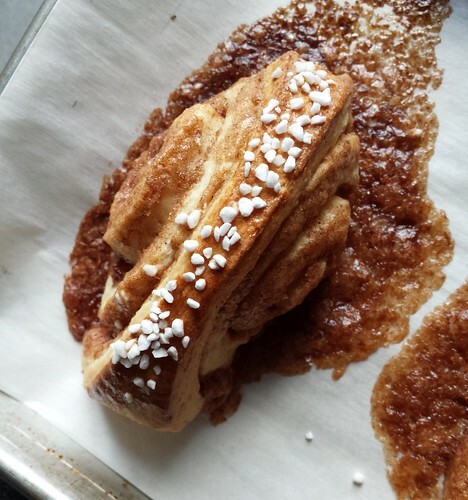 The cardamom-scented dough smelled ridiculously good and I knew a lovely afternoon coffee bread was in my future. Some fell over. Some blew apart. 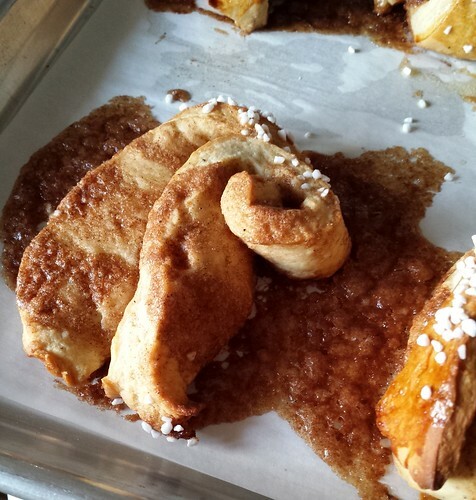 Every one bled sweet cinnamon filling into a pool of buttery sweet mess. Only a handful remained standing (they must be the victors). I salvaged those few good looking ones. I let out a deep sigh of disappointment and had my afternoon coffee with the ugliest of the ugly buns. You know how people always say don’t judge someone by appearance? That’s good advice. 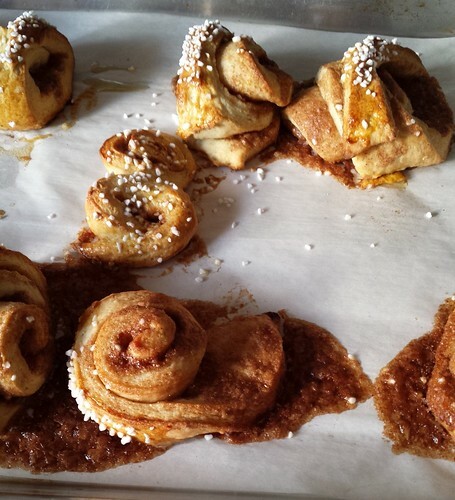 Despite looking nothing like the Pinterest photos, the korvapuusti tasted amazing. The buns were buttery but not heavy. 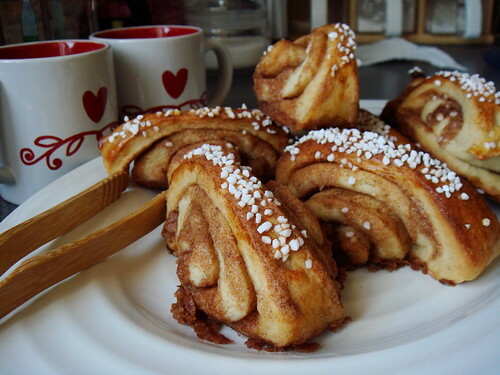 The sweet cinnamon taste was balanced by the slightly exotic cardamom. There was no cloying icing yet the crunch of pearl sugar more than satisfied my sweet tooth. It was a lovely afternoon treat. 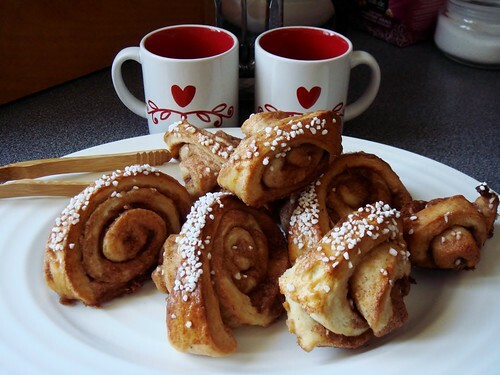 I am not sure I want to make Finnish cinnamon rolls again. The distinctive shape is part of its appeal yet I cannot think of how to remedy my low rate of success. Perhaps I should stick of a braided loaf shape. It is just as tasty and certainly easier to achieve. Next time!